Verify that you got your color code right. Make sure that you followed the instructions, including the use of the test card. Confirm that your vehicle has not been repainted with a non-factory finish. Display that your finished product does not match. If, at this point, something’s still not right, we’ll replace your paint and get you the guidance you need to make that match. Documentation of the non-matching paint and your steps in the process will be essential to figuring out the correct paint color, so please photo-document everything. In order to ensure that the color you are selecting will be an exact match, you will need to locate your vehicle's color code. If the color code on your vehicle matches the color selected, you should receive an exact color match. We do not recommend using the color name as a color match indicator, as many codes can share several names. Please keep in mind that all touch up jobs are not the same. Depending on the severity of damage to the area you are touching up, you may require primer or filler as well. 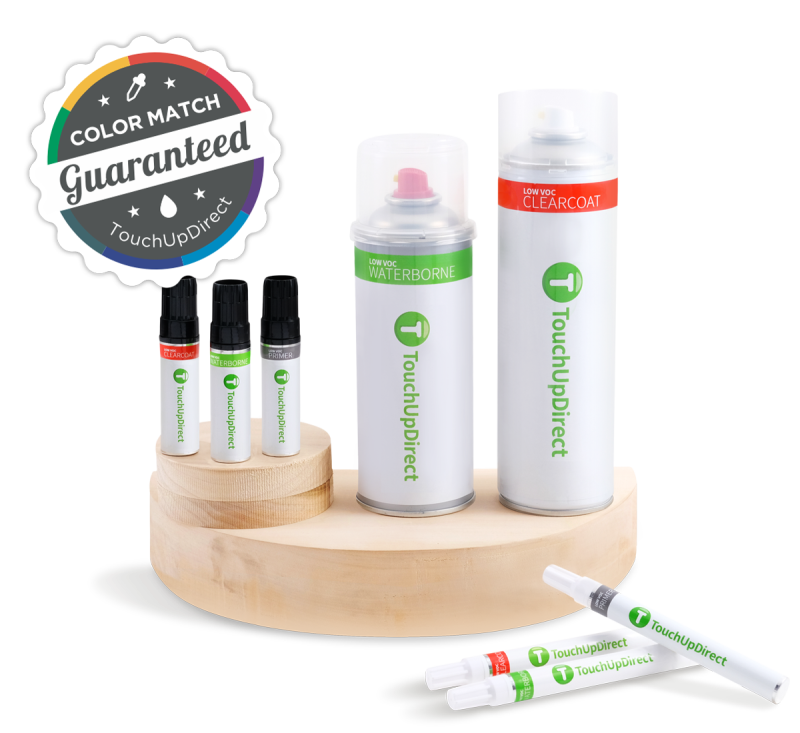 Take note that all TouchUpDirect paints require clear coat which is included in our Essential, Preferred and Platinum packages. Aerosol Spray Can - Aerosols are designed to re-spray an entire area (think hoods and bumpers). If you need to repair a damaged bumper or repaint your mirror cover this would do the job. Each method of application varies depending on what tool you are using for your touch up job. As a general guide here are some helpful application steps. How to use an aerosol spray can to touch up your car paint! Using an aerosol spray can to touch up or repair your car paint can seem like a daunting project. We've broken it down to the exact steps with to make it simple for you to do at home. With the right tools and correct paint color, your car will look like a pro did the job! Uri: Hi. Welcome to the TouchUpDirect aerosol video. In this video, we're going to show you just how easy it is to repair a scratch or damage on your car using a TouchUpDirect aerosol can, and to help us with our project, the Angelina Jolie of touch-up paint videos, Boris. Say hi, Boris. Uri: A TouchUp jar, TouchUp pen, aerosol can. In this case, we're going to focus on the aerosol can. Your first step is to assess the damage that you're trying to repair. Boris: Assess where you're going to be working. This is the bumper here. You don't want to get any damage, any scratches with the sandpaper on that part of the bumper, so it's a 500-grit sandpaper, which you start sanding this area. Then, you dry it really good with any paper towel or rag, anything like that. Uri: Prep the surface to get it ready to prime. Boris: Now that we're done cleaning up, taping, masking everything off, TouchUpDirect Premium Tack Cloth. We're going to open it up, separate it a little bit, and clean up the dust that might be left, and every time you're going to spray, make sure everything is clean. You [inaudible 00:01:55] the coats on it. You're going to spray downward because remember we have the tape vent here, which is the back tape, so we don't have a hard edge. Then, you spray it. There you go. You put one coat, and we're going to wait a few minutes. Then, we're going to put another coat. Sometimes, if you put too much primer, it's going to run. We want to try and avoid that. That's why we do two, three, four coats of this. Boris: Now, we're going to start re-taping everything. Yeah, it's a little bit of work, but you know what, it looks great after you're done. You can take the tape off. See, you're going to see the back tape line right there, which is this one here. That's what we want to get nice and smooth, so that you cannot feel it. You have to feather it. If you see a straight line, you need to go more like a feather it like this. There we go. Now, we can take the tape off, clean up the surrounding areas. Uri: Once you've successfully applied your primer, you're now ready to prep it for color. Boris: TouchUpDirect. It's water-based paint, so remember to take your time very well. What you're going to do, you're going to try and stay where the primer is, okay? Spray that only to that area first, the first couple of coats or to this cover, and then we're going to do a little blend, so same thing. This is all done. This is a test panel, so you're going to have to be about eight to 12 inches away from the area, and don't press the trigger too fast, just kind of like you're going to fan it. See? There you go. You're fanning it, spraying downward. All right. Now, we wait the proper amount of time. We're going to apply a second coat on it. Then, work downwards and try and get it colored. Put [inaudible 00:04:40] light coat on it. Boris: All right, so we have our third coating there. We're going to make sure that we have everything covered. Look around every area and make sure you have enough paint. All right. Now that we got coverage, everything is there, we're going to do a little mist coat, kind of like that so that everything kind of blends in. There you go. That's your control coat. Boris: All right. Now, we got everything done. This is a TouchUpDirect clear coat, and where you're taking the can, you're not going to hear the agitator in this inside because it doesn't have one. You don't need one on this, so after you check it well enough, make a pass, your test pass, and then go, overlap about 50%. Remember you're spraying down in the top. That's it. This is going to be our second and most likely our last coat, so we're going to go a little bit heavier on it. Make sure that you're taking the time to spray can. Do your pass, and here we go. I'm going to do these areas first, and then we're going to go 50% ... Oh, I'm sorry, 75% on it. That's going to be it. Uri: Once the clear coat is thoroughly dried, you can wet sand, buff, and polish as you can see Boris doing. Boris: Make sure that we have everything nice and smooth, and then we're going to polish. Once we polish it, we're going to be able to see how everything came out. This is going to bring out the gloss on the clear that we applied to 2000 grade. Wet sand it, and we're going to start polishing. There we go. We use TouchUpDirect polishing compound. Open it, and what I do is I use a little rag. I apply some in the rag, and I use a circular motion to polish. There we go. This will bring up the sheen in this area. As you can see, it's already looking much, much better, and you get a dry area on the rag and polish it off. How's it looking, guys? Look good? It looks more beautiful. There you go. Uri: With these simple steps, you've restored your car to factory finish, protected it from corrosion, and saved some money along the way. Thanks for using TouchUpDirect.